Thursday February 2 1911 It was such a fine day. George & Flora Stevens with Mother & Hattie were out for the day. We had a good visit. Will & I went down at 6.15 to spend the evening with Gill & Artie [Paul?]. Friday February 3 1911. We were both at home all day. Will worked at the wood and I was busy sewing. Weather good Saturday February 4 1911 I was busy in the kitchen all forenoon had dinner to Will went to town at 12.12. I sewed all the afternoon and evening. It looks like storming. Sunday February 5 1911 I went to church but cam home in a raging snow storm. I wrote and read in the afternoon. There was a [perfect?] blizzard by night. 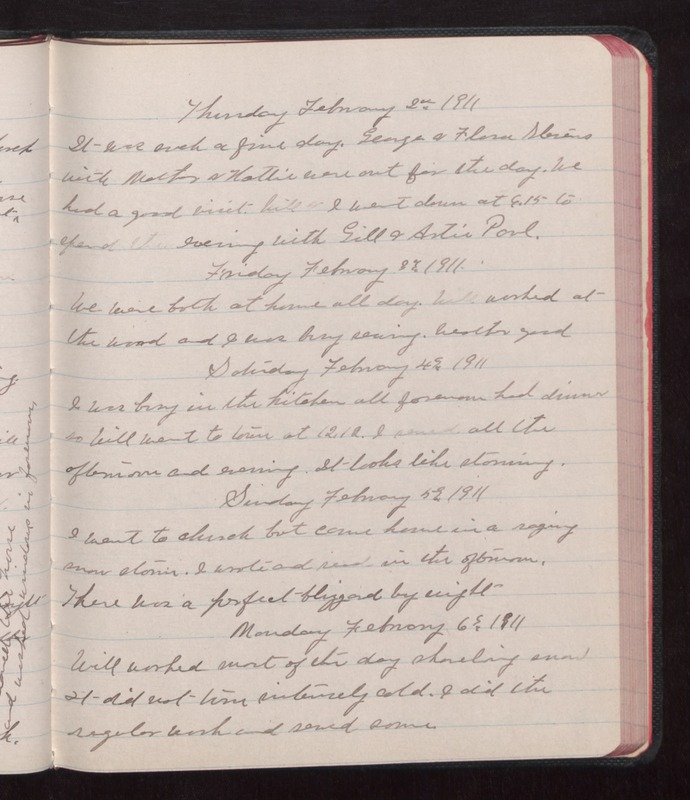 Monday February 6 1911 Will worked most of the day shoveling snow It did not turn intensely cold. I did the regular work and sewed some.